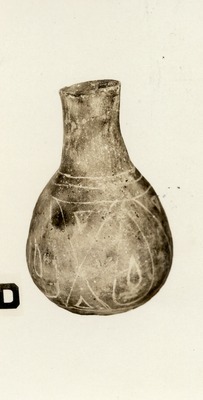 "41HS3, 730, Burial A-56" by Timothy K. Perttula and Robert Z. Selden Jr.
DECORATION (INCLUDING MOTIF AND ELEMENTS WHEN APPARENT): The exterior vessel surface has a red slip along with engraved elements. The upper part of the vessel body has three horizontal engraved lines, and there are two horizontal engraved lines at the bottom of the body. Between the horizontal engraved lines are four sets of upper and lower large stacked engraved pendant triangles with an inner triangle element. Between the stacked triangles are four separate large oval or tear-shaped engraved elements with an inner oval-shaped element. Ripley Engraved, var. unspecified bottle, No. 730, H. R. Taylor site.